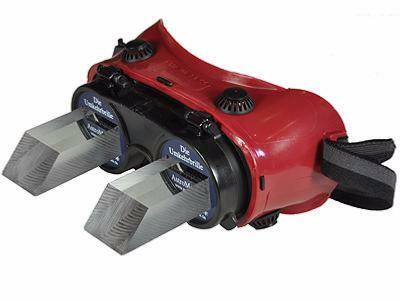 These amazing Reversing Goggles allow you to view the world upside down! 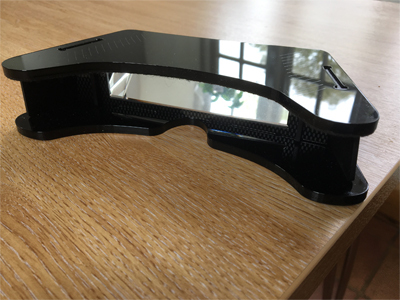 The plastic goggles hold two Dove plexiglass prisms, which invert the image. Alternatively, you can adjust the prisms in order to create right-left inversion. Since the time of Leonardo da Vinci (1452 - 1519) people have wondered about the fact that the images of the world that fall on our retina are upside down, yet we see the world the right way up. Back in the 1890s the American scientist George Stratton conducted an experiment to see what would happen if he viewed the world through an inverting prism. He found that after 4 days, his brain started to compensate, and he could see the world the right way up again. We are not suggesting that you recreate George Stratton's experiment. However, it is fascinating to wear the upside down googles and try to shake hands with someone, pick up an object, pour water from a jug into a glass, try and write, or find your way around (with someone else there to guide you of course). When we view the world normally, our brain reverses the images on our retina in both the up-down and right-left directions. These prisms reverse the up-down direction only. However if you rotate them by 90 degrees, they will then reverse left-right instead. The kit includes the lightweight, ventilated plastic housing, two prism holders in MDF (medium density fibreboard), two high quality Dove prisms in lightweight plexiglass giving a 35x20mm view, plus a small file for smoothing edges. A small amount of assembly is required. You will need a protractor in order to measure a right angle and some 2 part adhesive which hardens quickly. Optionally, you can apply some black paint to the prism surfaces which are not needed, which will improve the picture quality slightly. Suggested Age 18+. Made in Germany.Safety Notice. Wearing these goggles will cause you to lose your normal orientation. Do not make any movements while you are wearing them which could cause you to fall and injure yourself. If you want to examine the effects of inverting your vision, you should wear the goggles for at least an hour. However some people may feel unwell if they wear the goggles for a long time. If this happens, discontinue their use. We probably don't need to say this, but don't drive, drink alcohol or operate heavy machinery while wearing these reversing goggles! Skittle disapointed from the googles cause you don't see one good picture. All good! Fast shipping! Good item! Very disappointed by the product. The item is definitely not what i expected. 1 ) The two prisms do not fit at all the cut of the glasses, making them move, or even fall. 2) Even if adjust it by yourself with paper.... it well never be accurate enough, so your view is never straight. 3) The field of view is tiny. => This is a product you won't use for more than 5min. I wanted to do experiments wearing upside down goggles for a longer time. It's a failure. It would have been nice to have English instructions for the product. They are also missing a way to hold the lenses to the paper cards and I need to find a suitable 2 part epoxy to glue them together. Bad qualitiy. Inpissible to assemble.